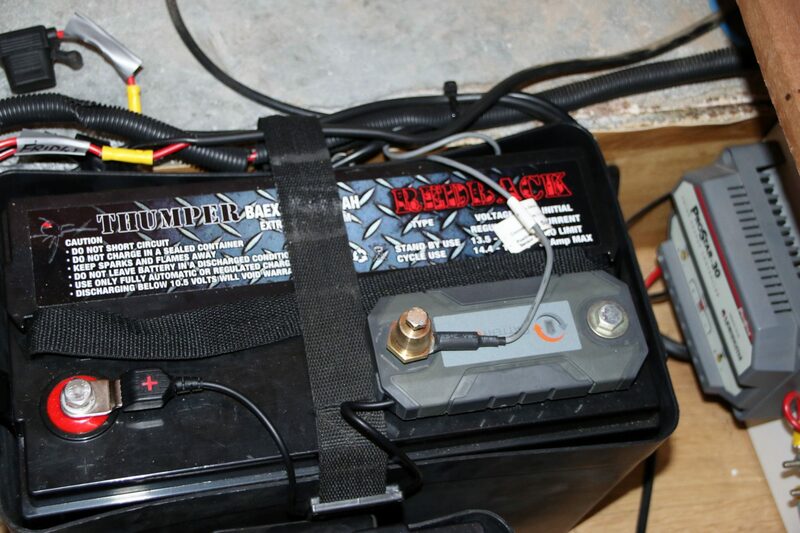 With many RVs these days using 12v batteries for functions such as lighting, operating pumps, powering electronic circuits in fridges and gas heaters, plus a bundle of other accessories, you come to rely on the fact your batteries are in good working order especially when going off the grid. After learning the hard way that volts only tell part of the story, we found there’s a lot more to it when it comes to measuring battery conditions. 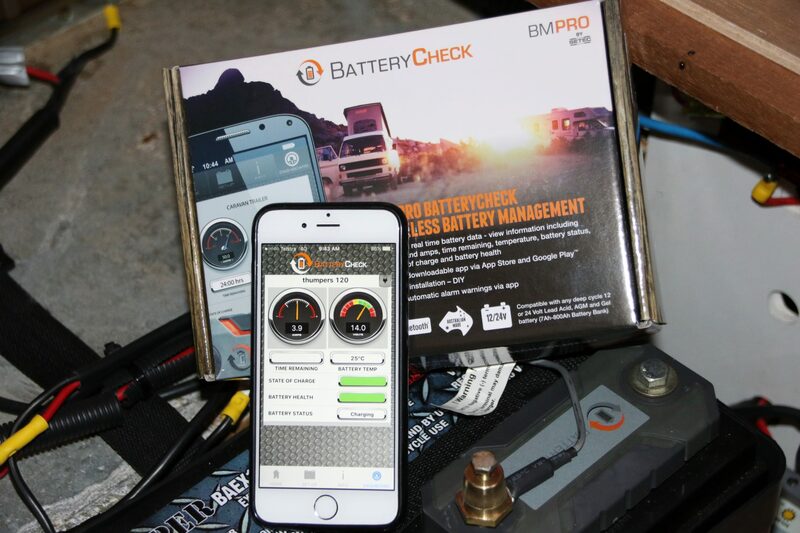 So we were as keen as mustard to try out a battery monitoring checking device we came across called the BatteryCheck by BMPRO. It’s a simple retrofitted device that monitors single or multiple batteries; it connects to a range of standard battery types including AGM, Gel, Lead Acid and flooded, and requires no significant re-wiring. To top it off, the device communicates wirelessly through an app to smartphone and tablet devices. We found this to be exactly what we were after, as our caravan is several years old and already fitted with a battery charger and solar regulator. We didn’t want to go to the expense of replacing them just so we could have a measuring device. The device provides real time data that allows you to see the remaining energy in your batteries via the app. Information such as voltage in/out and amps in/out is displayed, and the display also includes the overall battery health and state of charge. It was a very simple DIY install when ours was up and running in under 20 minutes, and there is no doubt the unit has helped us to balance our 12v system. 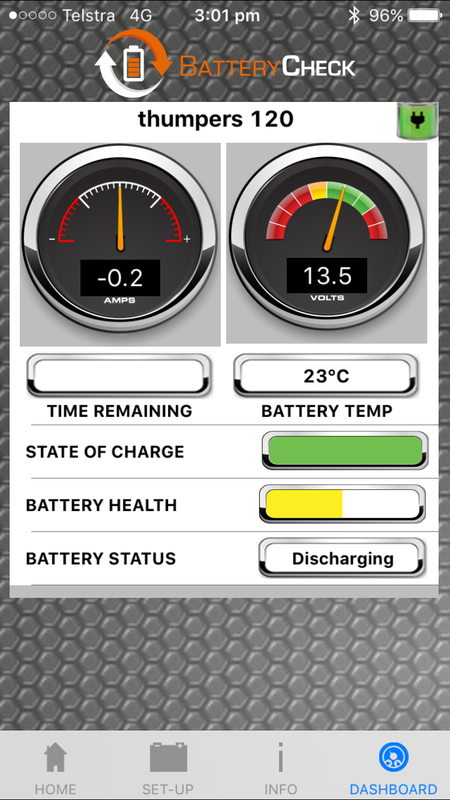 We can now easily see what’s happening with our batteries when running 12v devices via the app, and the unit also provides an indication of the state of recharge from our rooftop solar panels. With the availability of real time information, this allows us to make informed decisions as to whether we need to reduce our power usage, or add more recharge either via solar, vehicle alternator, plugging into 240v mains, or with a generator. Once we have made a recharge adjustment, we can immediately see the effect any of these options has on the system. We conducted a significant amount of research before making our purchase, and found there are some very sophisticated battery management systems in the market today. While many provide a lot more history logged data information over multiple days, they are significantly more expensive to purchase, and require additional wiring and knowledge to install. This was something we tried to avoid. With its ease of installation, real time data display, and the ability to use our smart device with the information needed to manage our power usage, we’re happy with our BatteryCheck purchase. It’s even so clever that we get a message on our smart device when approaching our RV, requesting us to connect to the device to display our batteries’ status. It’s like we have our own battery concierge watching over our 12v system, so for that reason alone we give it a double thumbs up.